Thanks to the ever-increasing popularity of RVing — a trend that we are obviously a part of — in order to secure camping spots in the most popular destinations we have to plan our travels around school vacations, holidays, and other markers of “high season.” In part, this means planning fairly far in advance and also being extremely patient, since we often have to try for weeks to make reservations in the top spots. It also means that we try to visit the most popular destinations in the shoulder season to avoid crushing crowds. For example, our next stop will be at the South Rim of the Grand Canyon, which we are visiting during the third week of March in an effort to get ahead of the big summer crowds that descend on this extremely popular park. Of course, there is a reason that most people visit the canyon in the summer, and it’s not just the convenience of summer break. The South Rim sits at around 6,000 feet of elevation, while the North Rim reaches over 8,000 feet. With those elevations, winter conditions are a real concern. Traveling in shoulder season is inherently risky — we could experience pleasantly warm, sunny days, or we could encounter unusually bad weather. Our choice to get to the canyon early in the season brought us into Arizona’s high country in late February, where we dealt with snow on the ground in Cottonwood and some wintry windstorms in Winslow. But the risk of traveling in shoulder season really came crashing down when we reached Flagstaff, our final stop before the Grand Canyon, and encountered true winter weather in this high elevation city (7,000 feet). 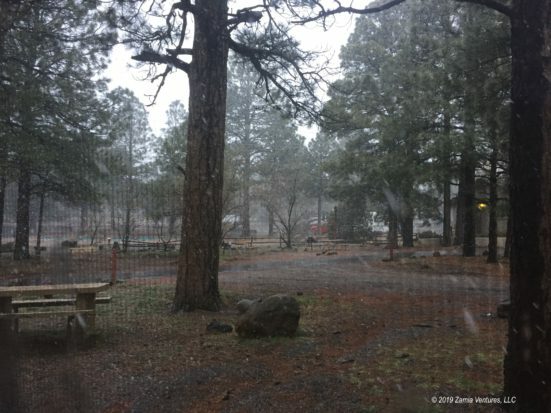 For our first several days in Flagstaff, we were walloped by persistent freezing rain, followed by snow, all while temperatures hovered below freezing, even during the day. Some people love doing outdoor activities in cold weather. They are happy to layer up and hit the trails despite (or maybe even because of) thick snow and the sort of biting wind that brings tears to their eyes. 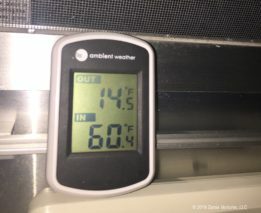 The bitterly cold temperatures kept us hunkered down in the house for several days, running both our propane furnace and our electric space heater in an effort to keep the chills at bay. 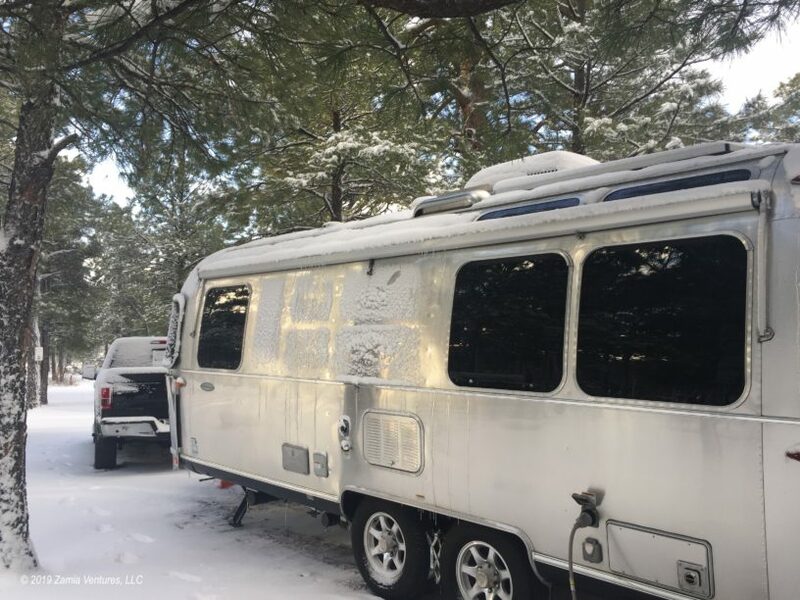 Besides making lots of soup, baking bread, and finishing several books, our main activities were brushing snow off the truck and knocking icicles off the Airstream. 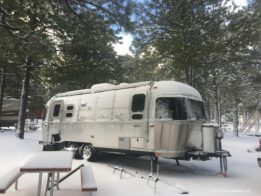 Once the daytime temperatures got above freezing, we were finally able to explore some of the interesting things that the Flagstaff area has to offer. 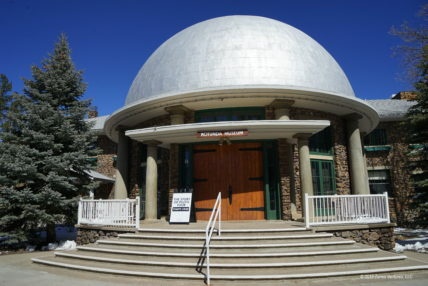 One place we didn’t want to miss in Flagstaff is the famous Lowell Observatory. We started our visit with the History of Lowell Tour, which covered everything from the Lowell family background to the story of the construction of the observatory by a wealthy amateur hobbyist (Percival Lowell) to the current research being conducted by the astronomy staff. 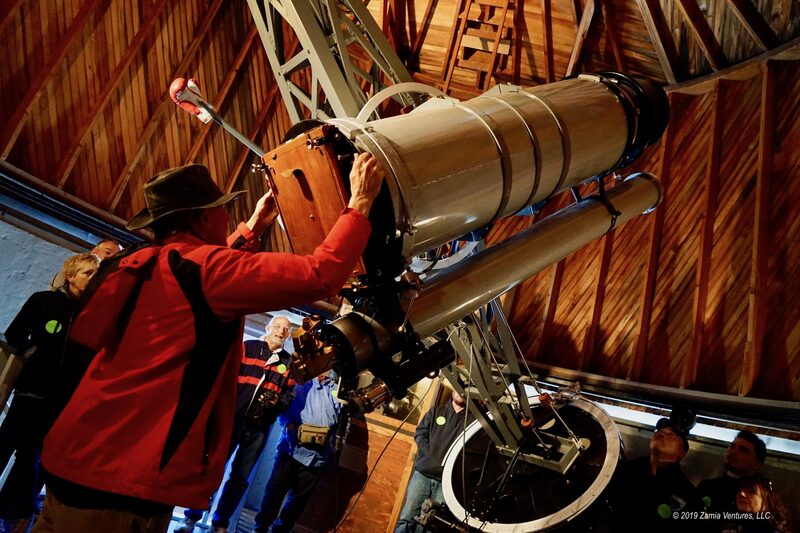 The highlight of the tour is seeing the 24″ Clark Refracting Telescope, which saw first light in 1896. As we learned from our visit to the UA Mirror Lab, refracting telescopes — which have star light passing through a glass lens before being focused on an eyepiece — have a natural maximum size limit before the weight of the glass itself causes the lens to distort. Large refracting telescopes also require a very long tube to focus the light. 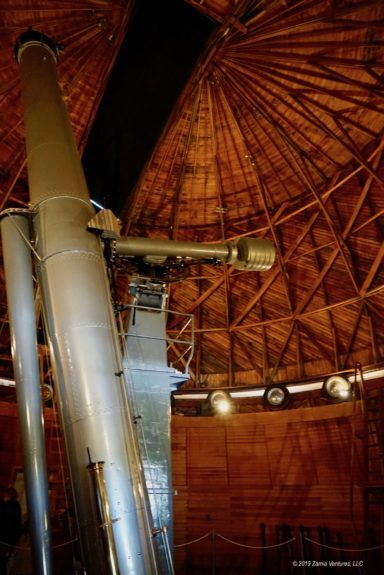 The Lowell telescope is considered the finest example of the largest possible refracting telescope (it’s nice to have a fabulously wealthy patron buy the very best equipment), and was used in many historic investigations. Some of these were dead ends, like mapping the “canals” on Mars supposedly built by Martian civilizations. Others were truly groundbreaking, like the spectrographic analysis of other galaxies that laid the groundwork for Edwin Hubble’s theory of the expanding universe. The 24″ scope was of such high quality that it was selected by NASA as the primary instrument for mapping the surface of the moon in the 1960s in anticipation of the moon landing, even though it was 60 years old at the time. As is so often the case, the quality of our tour guide really elevated the tour. Jim was obviously well-versed in astronomical science, but he was also a masterful story teller. He managed to communicate an immense amount of historical and scientific information within a presentation that was as compelling as a novel. Our tour guide was so great that we decided to stay for a second back-to-back tour, this one focused on the discovery of Pluto. Once again, Jim kept us at the edge of our seats with the gripping story behind the search for “Planet X,” while explaining the painstaking process that Clyde Tombaugh used to take and analyze photos of the sky in a true needle-in-a-haystack search for the tiny planet. Showing the operation of the Pluto Discovery Telescope. The flat wooden box held the photo plate. We loved visiting Lowell for its connections to astronomical history, and even the gift shop was a nerd’s delight. We headed a few miles north of Flagstaff on a sunny day to check out Sunset Crater Volcano National Monument, even though were weren’t all that impressed by our prior volcano/lava encounter at Craters of the Moon National Monument in Idaho. Sunset Crater exceeded our expectations and turned into a really enjoyable stop. The cinder cone volcano and nearby lava fields have the same forbidding textures we experienced before, but the hardy dwarf Ponderosa pines and the breathtaking views of the snow-covered San Francisco Peaks made for a compelling landscape. Even though the eruption was in the 11th century, and the lava fields were still razor-sharp with little sign of weathering, the emergence of sparse trees made all the difference in turning this into a more inviting place. We tackled a few short trails in the vicinity of the main volcano (the Lava Flow Trail and the Lenox Crater Trail), which proved to be challenging enough at 8,000 feet of elevation. It was a relief to get outside and knock the dust off our hiking boots, especially in such a strangely beautiful place. The story of how Sunset Crater became a monument is yet another tale of how ridiculous people can be. A Hollywood production crew made plans to blow up the cinder cone to create special effects for a movie in 1930. 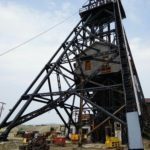 The ensuing public outcry led to the site becoming federally protected, so fortunately there is something to prevent the next idiot with a bright idea from destroying the area. We particularly liked that this park keeps the main cinder cone off-limits — unlike the designated hike up one of the largest cinder cones at Craters of the Moon, which we found to be a weirdly destructive use of park resources. Our final destination in Flagstaff was the Walnut Canyon National Monument, which preserves a dense group of cliff dwellings perched high above a creek. We had pretty much reached our limit on visiting pueblos built directly on the ground, which seem to be quite similar and in many cases are not much more than piles of rubble. The cliff dwellings at Walnut Canyon are built into niches high on the sides of a deep canyon, offering sweeping views of the surrounding area from perches of perfect security. The shady side of the canyon featured tall pines and plenty of remaining snow and ice, while the sunny side was populated by desert plants like prickly pear cactus and yucca. We really enjoyed seeing how these ancient people lived, even though Ken was not a fan of the high elevation walkway that lacked handrails, and I was not a fan of the hundreds of steps we had to climb in the thin air of 7,000 feet of elevation. Next we head to the Grand Canyon in search of warmer weather and more opportunities to hike. I completely agree with your assessment of Sunset Crater vs Craters of the Moon. We haven’t been to either, but your pictures make clear that Sunset is so much more inviting. Amazing what a few trees will do for a landscape. Interesting commentary about protecting these properties…. You really have seen the whole range of possibilities recently – from trying to rebuild ancient structures, to allowing people to wander all over delicate natural phenomena, to actually protecting both… I was just reading about Petroglyphs National Monument, which is in our current area. and I was heartened to see visitors are no longer allowed anywhere near the petroglyphs. There are clearly marked pathways and visitors can see the drawings from several feet back, but they are not permitted to get up close to them. Sounds about right…. Here’s hoping for warm weather for all of us! From your description, Petroglyphs Monument is really doing it right! I’ve been surprised by the lack of consistency in how the different parks handle resources. It would be nice if best practices were shared and applied throughout the system. We have a similar approach to our travel planning and wish we could travel everywhere in the shoulder season. As you said, the weather can be iffy, but then again, apparently it’s iffy everywhere all of the time now! Witness this past winter in Tucson and Phoenix. 🙁 Your temps in Flagstaff looked like ours in the Davis Mountains in December…but you had way more snow! 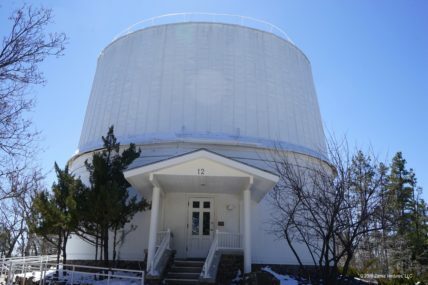 We enjoyed both Sunset Crater and Walnut Canyon but haven’t been to the Lowell Observatory. It’s going on our list! Our subsequent visit to Grand Canyon was a perfect example of shoulder season drama: two days of nice, relatively sunny weather and two days of snow. Oh well! At least we mostly beat the crowds. We usually don’t mind the excuse to stay in on a cold or rainy day or two to get things done without feeling like we’re “wasting” good weather, but some of these cold snaps in the southwest this winter have been ridiculous! Where’s all the sitting outside time we’re supposed to be enjoying as full-timers? Oh, well, here’s to perseverance and warmer times ahead! I agree with you that normally we don’t mind one or two inclement days — they are a good excuse to do travel planning and research! But the extreme cold we faced in Flagstaff made it hard to get anything done, mostly because I spent the entire time thinking about hot tea and soup. We definitely miss sitting outside …. when will that ever be possible again? ?